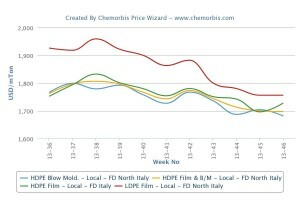 In Italy, initial PE prices for November were revealed with decreases of up to €30/ton in line with the ethylene contract drop and subdued polymer demand in Europe after three digit decreases passed on done deals in October as per the pricing service of ChemOrbis. 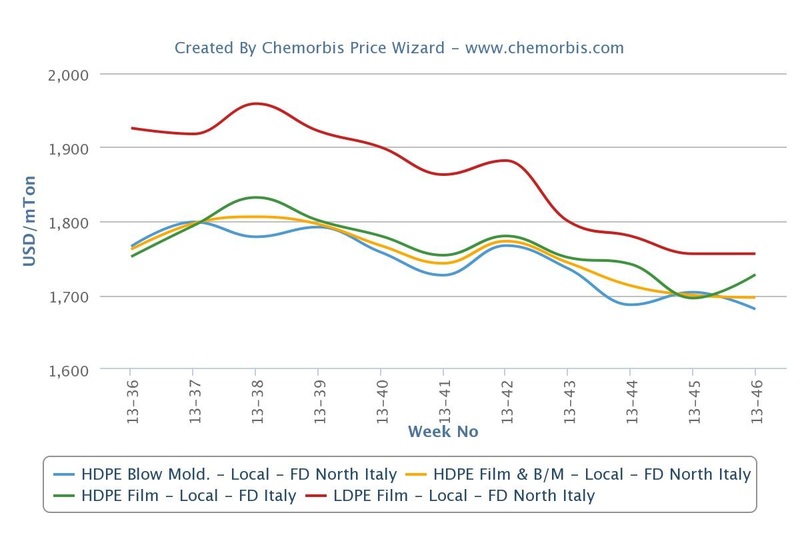 However, starting from late last week, divergent pricing strategies emerged as buyers reported receiving higher offers for some West European origins with respect to late October since supply constraints, especially for LDPE and LLDPE, encouraged suppliers to adopt a firmer stance. According to market sources, a South European producer shut their LDPE plant in Spain at the weekend due to a fire. The company, which had already planned a maintenance at the facility, didn’t disclose a restart date, while their cracker is also undergoing a turnaround until end November. Another producer will shut their 670,000 tons/year cracker in Spain which feeds their downstream PE units given uncertain demand conditions, market sources reported. The downstream site will reportedly operate at reduced rates. Players started to comment that PE prices may be nearing the bottom already while they blamed limited supplies rather than a notable pick-up in demand as the main reason behind sellers’ firmer attitudes. On the other hand, some buyers noted that discounts may still be obtainable on the upper ends of the market with no major supply concerns on their own side since they keep purchasing cautiously ahead of the year end. “Demand is slow and we expect to see a recovery starting as of January at the earliest. The outlook is bearish for December,” said a cable manufacturer. In addition to restricted availability on the part of some PE sources, developments in upstream markets provide some support for stronger expectations. Now that ICE Brent crude oil prices for December managed to gain nearly $2/barrel on the week, spot naphtha costs firmed up by $20/ton in the same period to move $25/ton above a month ago levels. Spot ethylene costs slipped just €10/ton on FD NWE basis on the week and since November started. They still indicated a €45/ton drop from a month ago levels though. This week, more PE prices were reported with rollovers and even with hikes ranging between €10-50/ton over late October levels although €30/ton decreases continued to pass on deals in some cases. A food packager reported that they purchased 2 cargoes of LLDPE in November while they noticed that they had to pay a relatively higher price with respect to October. “We may consider purchasing some additional cargos if we get a good offer although we can continue our production until the end of the year with our existing inventories and we don’t want to stock up for the year end. There is not much material in the PE market,” mentioned the buyer. A shopping bag converter said, “We purchased only 2 LDPE cargos as we prefer to buy from hand to mouth. We paid €40-50/ton higher prices than we saw by the end of October for South and West European LDPE materials. Availability seems normal for the time being.” A masterbach manufacturer was trying to negotiate to obtain a lower level for a West European material as he needs to purchase some LDPE cargoes this month. “I heard about a possibility for increases in January,” he noted. “We are selling our West European HDPE b/m quotas for November with €20-30/ton decreases, but we have limited allocations for this month. We expect a reversal in the market trend in December,” a distributor said. A distributor in Germany reported asking for rollovers recently from October after initially approaching the market with €30/ton reductions on the month in the beginning of November. “Demand is a bit better than past months. Some of our customers told us that some Middle Eastern and West European producers stopped their orders. Availability seems to be lower regarding LDPE and LLDPE,” he stated.